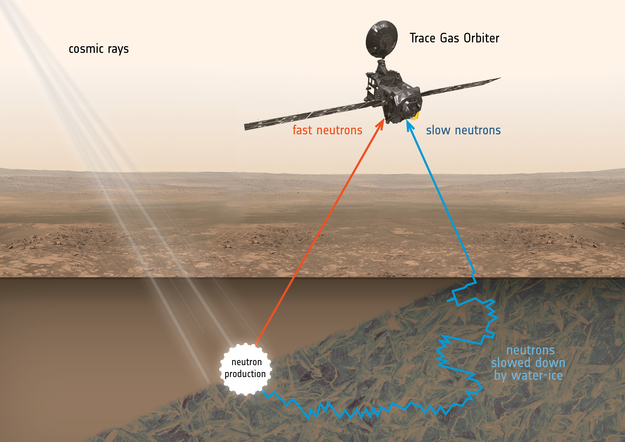 The ExoMars Trace Gas Orbiter will use a neutron detector – the Fine Resolution Epithermal Neutron Detector or FREND – to map subsurface hydrogen to a depth of 1 m to reveal deposits of water-ice hidden just below the surface. The graphic shows a simple representation of the detection process. Cosmic rays constantly bombard the surface of Mars; they knock neutrons out of the atoms they encounter on the surface and underneath. If water or frozen water-ice is present, hydrogen atoms cause multiple reflections in their paths through the subsurface, slowing down the neutrons. While some neutrons are captured in the subsurface, others escape back out into space. The speeds at which they arrive at the detector on TGO help determine the nature of the subsurface: those that have interacted with water will have lost some of their energy, and be travelling relatively slower than those that have not.